The ACT Matrix is an incredibly flexible approach to doing ACT, as well as a handy tool in and of itself if you view it simply as a diagram. This flexibility lends itself to being used in a variety of population settings. Anybody from intake specialists, case managers, clinical directors, and beyond can learn to adapt the matrix for their work environment. For those who have strict guidelines on how treatment plans must be written the matrix can still be useful. I know how monotonous those treatment plans can be after a time. Rather than becoming rote and creating very similar plans over and over again, the matrix can add variety and creativity, as well as enhance the goal setting process for the client. Doing the work together with clients will also engage in collaboration on a deeper level. All while staying within the requirements of your work. Setting up the matrix to work for you is essentially exactly the same as the standard matrix formulation. In other words we move from the bottom right hand box, to the bottom left, and then up to the top left, and over to the top right. The only differences are some of the time spent in each section, and how we will be labeling some of the information that we get from them. Traditionally in the bottom right hand box we ask what is important to the client. When working with the matrix we often use that language, but you may also use the word Values. Values here as we know, are different from goals. Of course if we linger here long enough and explore a bit we can easily also see goals forming. And if we probe a bit we can also make out client strengths. 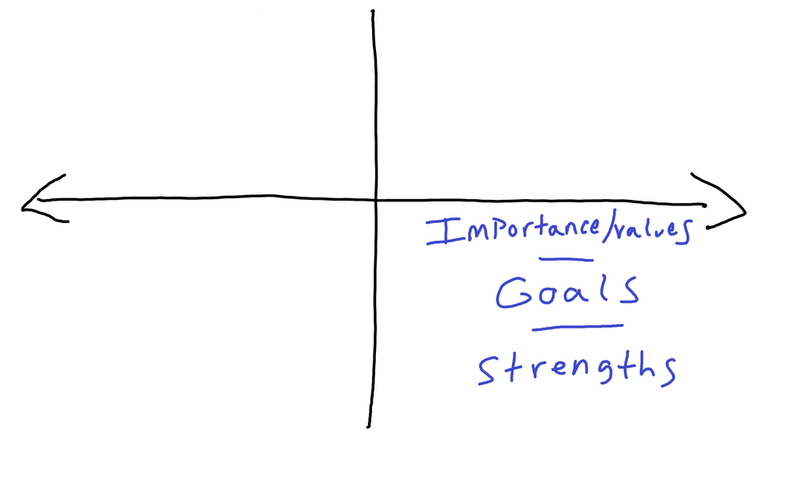 So we extend the bottom right hand box to include Importance/Values, Goals, and Strengths. You could straight up ask about goals and strengths at this stage if you like, or use your standard methods for uncovering that information. All pretty basic so far. Moving over to the bottom left now which is typically reserved for "inner stuff" like thoughts, feelings, and images. Here it may be helpful to be flexible, and think of this box as "barriers" to treatment/success/etc. These can certainly still be internal things such as specific thoughts, as well as external factors like "lack of transportation". Anything that the client identifies as a barrier can go in this spot. As we move to the top left box it can be done as usual. Actions that we tend to do when that inner stuff & barriers show up. It is possible that many of these actions would be considered unworkable behaviors &/or maladaptive behaviors. We may take time to explore workability here and to highlight any patterns of behavior which are occurring. Moving now to the top right box this is where a good portion of collaboration comes into play as the client brainstorms novel or expanded sets of actions to be performed that will be consistent with their values, oriented toward their goals, and that highlight their strengths. In the end, these will typically be short term goals. Whereas the goals in the bottom right hand box will tend to be long term goals. Ensure that those goals are broken down into bite sized portions and have clear time frames attached and you've got everything you need for a treatment plan now. Keep in mind that the act of going through a matrix like this is a skill as well as an exercise that could be a part of a treatment plan. For example, a short term goal would be to complete one ACT Matrix (or "Goal Setting Grid" if ACT throws off your bosses), each week. The client by the end of completing a matrix has done several measurable things, they've identified their own values, goals, and strengths. They've identified their own barriers, and they've identified workable and unworkable behavior/coping skills. Finally they've developed their own custom plan to achieving short term goals. All of these actions too are measurable and treatment plannable. Tailoring this all into a treatment plan, and using the trick of the matrix being both a skill and an activity that could fit into a treatment plan in it's own right, might create a new experience for you as you work with your caseload.